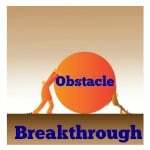 Obstacle Busting in 10 Simplified Steps - Brilliant Breakthroughs, Inc.
Is your business missing the mark lately? Have a boulder or two impeding your success? Obstacle, here. Obstacle, there. Obstacles, everywhere! Are your best business strategies letting you down? Recently, I was having a conversation with a business owner about how difficult doing their business has become. To them, it appeared there was endless array of obstacles to overcome, which seemed to deter them from success. Unfortunately time constraints didn’t allow this conversation to continue. Then I started pondering, how many other business owners or top mgmt. team members feel that they must overcome one obstacle after another? I’m sure many, who will admit this, and many more who won’t! Ah, I really want to give the elusive Oracle’s answer and say, “Know Thyself”. As true as it is, it may not be the most beneficial at this point! Let’s come up with something for you to work with this week by diving into our persistence awareness for you and your business. By definition, persistence is the concept of proceeding / constantly repeating / lasting / enduring / continued action in spite of opposition / staying on course. Now, we are not fools here and we realize “constantly repeating” may not always be the be solution. I believe the best definition of persistence for us is: “continued action in spite of opposition”. Why? It doesn’t say that we need to keep repeating actions which may not secure our desired outcome. It does however express that continued action – of some sort – is required! Working around or busting through one obstacle after another is critical to your success. Only you impede your success! Persistence Business Strategy to the Rescue! Acknowledge obstacles can only impede your actions, not your success. Select which ONE area of your business you would like to keep “continued action” progressing you toward your goal. Start here. Develop your Action Items for the (one) above strategy. Act your plan via your daily action items. Reassess your results and tweak your plan. Improve your (best or right) actions and mindset toward your goal. Become laser-like with your thoughts and actions. Master your thoughts and actions regarding this business strategy. Repeat with another Business Strategy. Tip: Don’t select another strategy until you implement this one into your routine consistently. Ready? Let’s make this 4th Quarter one of Great Change for you and your business!